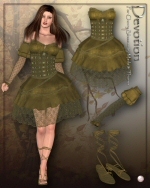 Presenting Devotion, a Texture Expansion for Cherry Blossom by Mada & Thorne. 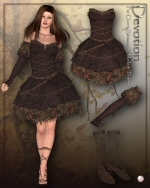 With this Texture Expansion you'll get 6 complete New and Highly-detailed texture styles for the "Cherry Blossom" outfit. From a Gothic Beauty to an Elfen Spirit, for Independent girls or Royal Spirits, style your ladies with grace and sensuality, let your inspiration guide your renders! Please have a look at the pictures for more information and details! Vic4, clothing, hair, poses and lights used on promotion pictures are not included in purchase! 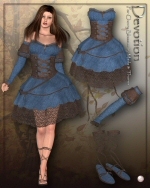 Requires Cherry Blossom (for Victoria 4 & Aiko 3) by Mada & Thorne (DAZ 3D).